Suitable for most of cameras and small lenses, for Sony A7 Series, NEX Series, A9 A6300, Canon EOS M Series, Fujifilm XA5 XT20 and so on. Soft internal layer to protects the LCD screen and lens from scratches and bumps, with extra small compartments on the side for other small accessories&apos; storage. Protects your camera against damages, such as dust, moisture and so on. 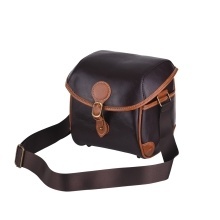 High quality PU leather, compact, lightweight, extremely durable material and easy to carry. Vintage style with neck shoulder strip, suitable for use when going out, very fashionable and practical. Suitable Camera: For Sony A7 Series, NEX Series, A9 A6300, Canon EOS M Series, Fujifilm XA5 XT20 and so on. Camera and lens in the pictures are not included.